A line has been drawn in the sand. 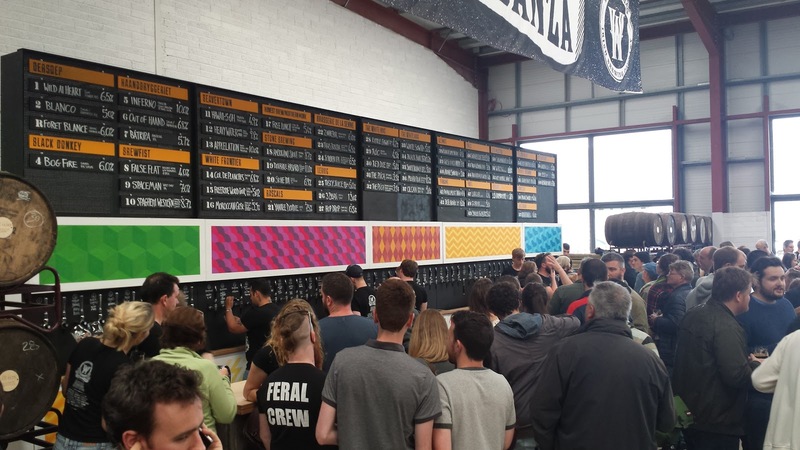 On the one side are all other beer festivals in Ireland with the traditional format. Pay in, get tokens, go to various stands and get beer, often served by the brewers or brewery owners themselves. On the other side of this line is Hagstravaganza run by The White Hag in Sligo. OK to be fair, the format is pretty similar. People generally pay in, get tokens and get beer. The difference here is the "getting the beer" part which I'll get to. 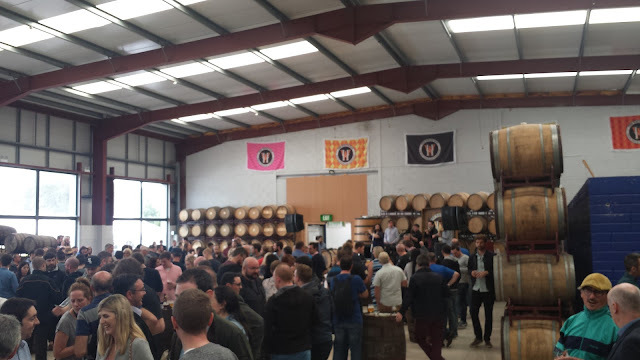 Hagstravaganza was the 3rd birthday party of The White Hag Brewery. 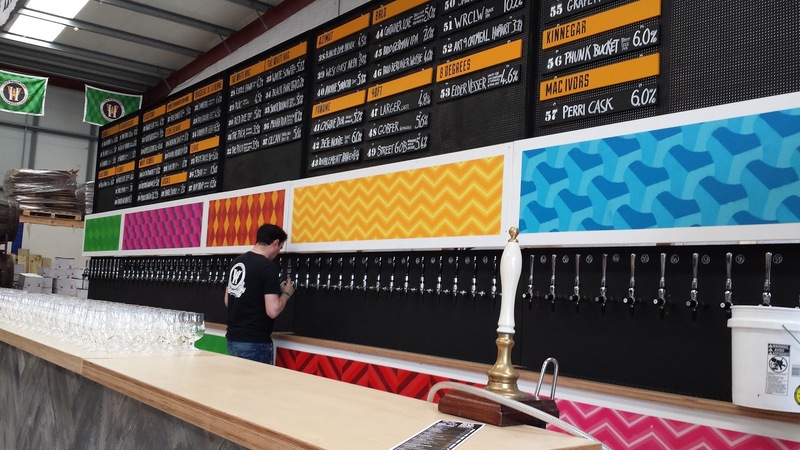 Last year, they celebrated their second year with a party and a mini beer festival after inviting a few friendly breweries along. Here are my thoughts on that occasion. Last year was great craic but this year was just epic. Let me explain how. 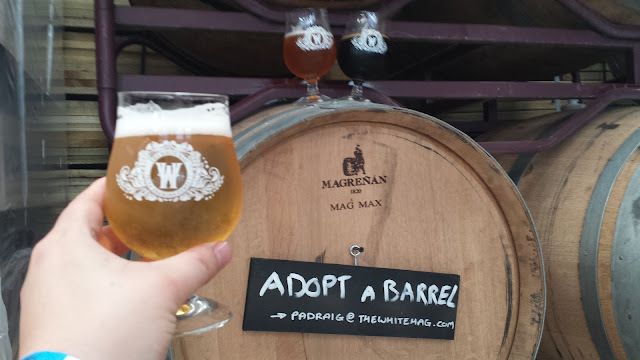 First, White Hag launched a sort of crowd fund where people could adopt a barrel for €250 and in return, you would get 6 barrel aged beers per year. Mine is pictured above with my name on it. We are also invited to visit the brewery and snuggle up to our barrels on the White Hag birthday, which this year was Hagstravaganza. You can actually still adopt a barrel it would seem. The form is linked above or just email Padraig, email address in the image above. Presumably your three years start from when you adopt rather than from last year. 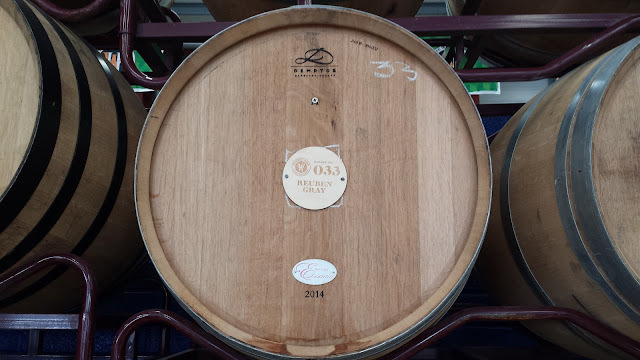 So, what we got as barrel adopters were as follows. Two tickets to Hagstravaganza but with the added bonus that we arrived at 11am instead of 2pm and had a barrel ageing masterclass. This was an incredibly informative few hours with Masterbrewer Joe and barrel expert Alex from France. They both talked about the different types of wood and barrels as well as the microbes involved. Both Joe and Alex have learned a lot from each other since they started the barrel project. Alex, who's background is of course in wine and viticulture has had his eyes opened up to the possibilities with barrel ageing and has learned not to be afraid of Brettanomyces (Brett), a wild yeast which will consume every molecule of sugar there is and would be detrimental to wine. Alex supplied Joe with a number of Brett infected barrels which in the wine trade would be marked for destruction by fire. By the way, if your Latin is a little rusty, Brettanomyces translates to British fungus which is pretty logical when you think about it. I don't recall if they mentioned that on the day but I learned that on one of my IBD Beer Sommelier courses. During the masterclass, we tasted three of the barrel aged beers that Joe deemed ready to drink. Two were paired with a local cheese and we had the cheesemonger there to give a brief introduction to the cheeses. The last one was bourbon barrel aged Black Boar and that was paired with some dark chocolate. Personally I would have liked to also have been given some blue cheese so we could taste the differences between the two pairings as both would work perfectly with the beer in different ways. Last tasting over, it was time to go get some tokens before the 2pm crowds arrived so we headed into the token tent to do just that. So onto the beer festival itself. The limited number of tickets available were completely sold out and in fact demand exceeded supply. Your normal €25 ticket got you 4 tokens. Each token was worth one beer. We were given a White Hag branded festival goblet which had markings of 250ml and 330ml and most beers were poured to the 330ml mark except in the case of some of the really high ABV beers which tended to be (but not always) 250ml pours. The full details of the breweries involved are here though that page might change in the future. 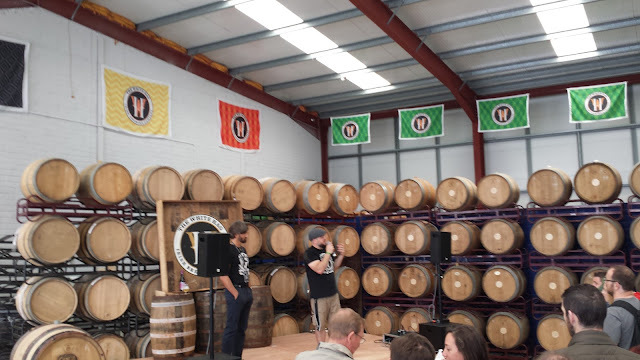 The idea of Hagstravaganza was that pretty much all of the beer available had never poured in Ireland before, well with the exception of the regular White Hag beers of course. There were 60 beers available, give or take. I say that because there may have been some that didn't get tapped in the end. We did have a shaky start where the power tripped in the beginning and no beer could pour as a result. Some quick thinking by staff saw cans of White Hag beer available which was the perfect excuse to start the festival off with some Little Fawn, their session IPA. That's never a bad trade-off to be honest. By the time I was finished that, the taps were going again and the agonising decision making began. There was no way to get through all 60 beers but we made a good go of it. The trick was to be in a group and get different beer where possible. That way everyone at least got a mouthful of something new and in some cases, decide it's so good we would have to to get our own. This was the case when Dorothy gave me a sip of Tasty Juice from Lervig brewery. It was a fantastic IPA so I immediately made it my next beer. As is my usual beer festival mantra, I didn't take any notes. I usually at least mark the beer I've had but I didn't have a pen so I decided not to bother. What I can say is that I bought 54 tokens between myself and Pauline. Six of these were used on food so that leaves 48 used on beer. I would say I had nearly a dozen tastes of other people's beer so that means I tasted about 60 beers over the course of the day. There would have been a couple of times when Pauline ordered the same beer perhaps because she likes it. There are a few beers I definitely didn't try such as Brewfist's Spaceman as I've had it in bottle a few times as well as De la Senne's Zinnebir as I've had that on tap many times in Belgium. One beer that stood out for comical reasons was Inferno by Haandbryggeriet in Norway. It's actually a three way collaboration between themselves, Brewdog and Stone. Since Zippo from Stone was there (as was Stone's beer) I asked him about it. He had no idea, had never even heard of it which we both found hilarious. He went off to Google it just in case someone else asked him about it. Some slightly negative observations on the day were something that many beer festivals suffer from. Toilets: not enough of them and they were the basic, plastic portaloos. For men, the bushes around the corner became a second home. Water: No drinking water taps available and only a limited supply of bottled water from one of the food stalls. This is perhaps the one that bothered me most as I like to hydrate in between beers. Tokens: While the tokens and beer were great value, we were encouraged not to bring cash and to use card instead but there was only one card machine available meaning the card line was slow moving while the cash line was much faster. Cash is still king it seems. No need to worry though, the organisers were able to observe all this themselves and will work on eliminating these minor issues for next year. The only other issue is the generous samples if you can believe it. When you have 60 beers to get through, getting a 330ml pour each time is a bit much. It resulted in me being completely incapable of going to the afterparty/pub crawl after getting off the complementary, special train they ran from the event to Sligo town. Then again, I had been there since 11am so it's not surprising. Smaller servings for a single token next year would actually be preferable. Perhaps 150ml for beers in double digits and 250ml for everything else. It's not the kind of beer festival where anyone could possibly want a pint and 330ml is still just too much both for our own sobriety and the organisers actually doing more than just breaking-even and I'm not sure they even managed that. A big thanks to everyone at The White Hag and to all the breweries who came over to a small town in the west of Ireland with their beer. It was an epic day out and has set the bar very high for the boutique beer festival. I doubt this format could work for the larger festivals like the RDS and Alltech or even Killarney but for the sub 1000 people mark, it's just about perfect.